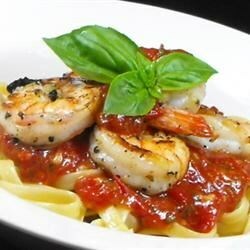 "This sauce includes shrimp and scallops, best served with linguine pasta." In a large saucepan, heat 2 tablespoons of the olive oil with the garlic over medium heat. When the garlic starts to sizzle, pour in the tomatoes. Season with salt and red pepper. Bring to a boil. Lower the heat, and simmer for 30 minutes, stirring occasionally. Meanwhile, bring a large pot of lightly salted water to a boil. Cook pasta for 8 to 10 minutes, or until al dente; drain. In a large skillet, heat the remaining 2 tablespoons of olive oil over high heat. Add the shrimp and scallops. Cook for about 2 minutes, stirring frequently, or until the shrimp turn pink. Add shrimp and scallops to the tomato mixture, and stir in the parsley. Cook for 3 to 4 minutes, or until the sauce just begins to bubble. Serve sauce over pasta. Watch how to make a nice and spicy shrimp and scallop pasta in this video. i used diced peeled tomatoes with liquid from a can to save time. it needed a little something so i splashed in a bit of red wine, added basil, and sauteed onions. tasted good.